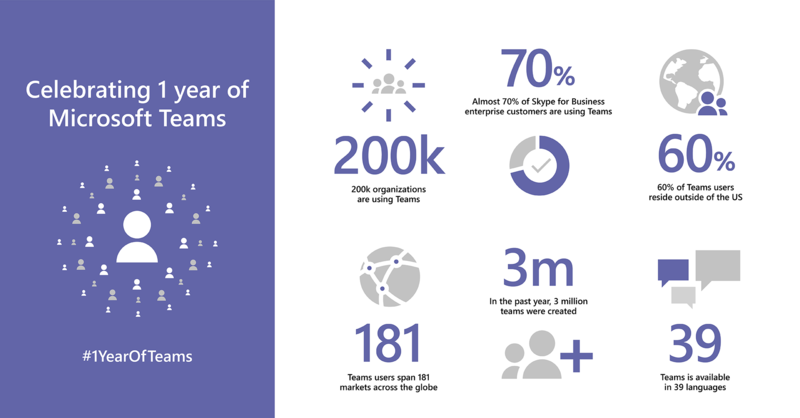 This week marks the first anniversary of the worldwide launch of Microsoft Teams. In that time, Teams has grown significantly in both new capabilities and customer usage. Today, 200,000 organizations in 181 markets and 39 languages use Teams, including A.P. Moller–Maersk, ConocoPhillips, Macy’s, NASCAR, Navistar, RLH Corporation, and Technicolor. General Motors is also now using Teams; read more about their story. 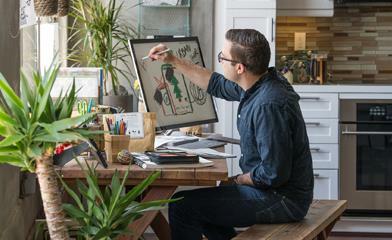 To learn more about the portfolio of Teams-powered devices and the roadmap dates, visit the Microsoft Tech Community blog. No ecosystem would be complete without the apps that make it thrive. We recently released a new store in Teams featuring a wide array of tools and services from our partners. Some of the most popular apps among Teams customers include Adobe Creative Cloud, Hootsuite, InVision, Polly, SurveyMonkey, Trello, Wrike, Zoom.ai, and many others. As we celebrate our first birthday, what’s most exciting are the stories of companies like RLH Corporation, Technicolor, and General Motors, for which Teams is truly changing the way people come together, innovate, and move business forward. RLH Corporation—In 2014, when Greg Mount took on the role of CEO at RLH Corporation, parent company to hotel brands like Red Lion Hotels, GuestHouse, and America’s Best Value Inn, he shifted the company’s strategy to move from being a Pacific Northwest regional brand to being a nationwide one. Since then, RLH Corporation has acquired multiple hotel brands, growing from 62 to over 1,100 hotels in just three years. To address change management and help drive a consistent culture within the company, RLH Corporation started using Teams last year. They looked at other chat-based collaboration tools, but because they were already using Office 365 and Power BI, Teams was the clear choice. Now, all corporate employees use Teams. The leadership team has moved from a more in-person and paper-based process for communications to more real-time interaction and data flow. Technicolor—A leader in the media and entertainment sector, Technicolor has used Teams within the Production Services CTO office to provide a new way for employees to collaborate around all things technical—from strategy to purchasing and everything in between. Technicolor Production Services business units are also starting to use Teams for high profile projects that require greater transparency and collaboration across many time zones and global offices, reducing the number of recurring meetings and flow of information internally and benefiting from a sole source of truth with cloud documents. Technicolor Production Services plans to expand its usage within other parts of its organization. As we celebrate our first year in market, we are thankful to our customers, partners, and of course those of you who have become avid Teams users for coming on this journey with us. We look forward to continuing to bring you experiences that enable your teams to achieve more together.